Saving the world's flora and fauna, especially high-profile examples such as chimpanzees, whales and the tropical rain forests, is big business. Individuals and companies channel their resources to the preservation of nature through various ways, one of which is the funding of environmental non-governmental organizations (ENGOs) and community-based organizations (CBOs). This book is the first to comprehensively address this issue and focus on a dominant theme in environmental philanthropy, the links between ENGOs and CBOs and their sponsors, especially the private sector. It has been argued that donor support is based on recipient's perceived expertise and needs, with no favouritism of flagship environmental organizations as recipients of donor funds. A counterview holds that the private sector prefers to fund mainstream ENGOs for environmental research and policy reforms congenial to industrial capital. The authors show that the debate about these arguments, together with the empirical evidence on which they are based, may shed light on certain aspects of the nature of environmental philanthropy. 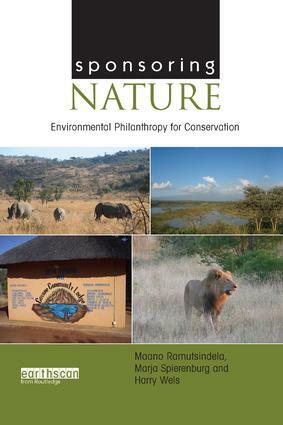 The book evaluates practical examples of environmental philanthropy from Africa and elsewhere against philosophical questions about the material and geographical expressions of philanthropy, and the North-South connections among philanthropists and ENGOs and CBOs.